It might just change the way you work. I’m personally pretty into this sort of thing, but I haven’t taken a deep look into it. I feel like, if anything was going to make us believe that Microsoft had good intentions with purchasing Github, it would be implementing a proper CI/devops system directly into the core product. The newer cloud version is much less painful to implement. I think building in CI capabilities was something Gitlab got very, very right. 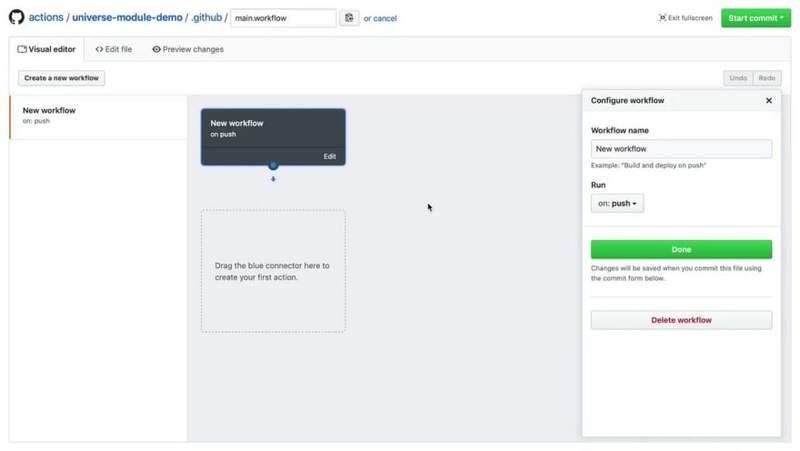 GitHub relied on its marketplace to provide many of the services that Gitlab has built-in. I think they might be seeing users making the switch to GitLab, and reacting to that. The visual way of setting up actions does look more intuitive than setting up GitLab Ci, though. That's right, however GitLab is painfully unstable / less reliable compared to GitHub, IMHO. There are discussions here on implementing a visual editor for the .gitlab.ci.yml: gitlab.com/gitlab-org/gitlab-ce/is.... With GitHub Actions, this will probably get prioritized. Environmental variables for GH Pages is huge for my students -- I have a similar set up with Netlify right now that I'm super happy with for personal use, but they usually use pages and this will help a lot. Just to mention an aspect I feel nobody else mentioned yet: GitHub totally takes over features, which used to be set up using the GitHub Marketplace – I do not want to know how people at Travis & Co. are feeling right now. How many of the Apps in the GitHub Marketplace have been rendered useless this way? That's always a risk when you build your own product on top of somebody else's platform. I have high hopes. I've fought with Jenkins, Travis CI, Circle CI, etc... throughout my career, I'm just kinda tired. Each thing has its own good stuff and bad stuff. I seriously just wanna run containers after hooks are fired. CircleCI and Azure DevOps come closest (sorry for the shameless Azure plug). Circle is cool b/c it supports any GH org you own, but it uses remote docker daemons that come with some weird limitations, and that config file - all that YAML! Not really sure if GH actions are good for CI - I'll probably keep existing stuff around (even if it's hacky) because why switch if I already did the work. But all the other stuff you could do! OMG all the other stuff. ... and tweet it out? It seems like a Zapier way of doing DevOps on Github. But I'm happy with all new features they can add so as to not having a need to use any other of its competitors. I'm happy about it but a few people mentioned that they're now competing with their own marketplace. It's always a tricky balance to not compete with your partners. In this case I think they did the right thing because the CI/CD workflow ecosystem has been very stagnant. I hope this leads to more innovative thinking in that space. Reminds me of Dialogflow + Google Functions but for pure CI entertainment. Perfect timing I'm developing a blog post on top of that. It looks pretty cool; I will love to use actions rather than writing my own integrations base on webhooks. It remains me to Shopify Flow. Looks pretty good to me, nice to see new features coming out! I am super optimistic about them. One step closer towards making GitHub more better without having to install a couple different automation tools. I think it's a welcomed change. I use the GitHub Desktop app for one thing. Am I doing this wrong?